Welcome to my little project board — just a tiny space to share with you some of the things I busy myself with outside of cooking, writing, and general loafing. From time to time I’ll change the posts on this page — rotating them out with new things or more seasonal things, so be sure to check in frequently. I was just… so verklempt when I saw the Moda charm pack entitled “Java”. I saw it and instantly knew I had to have it to make something for my favorite cafe companion, Nicole. Nicole used to be our neighbor before we moved to Northern Michigan, but we were friends even before then. Once she moved into the apartment just down the alley from our building, we enjoyed the convenience of “cafe time” — where Nicole would come over after work and we’d sit around, sipping coffee, talking our heads off, unwinding, and either working on our individual crafts (hers: knitting; mine: quilting) or tearing around the kitchen trying to make some kind of dinner happen. Thankfully, even though we’re across the big lake from one another and visiting involves one of us making a 7-hour drive (6-hours if you drive like Nicole… hehehe), we stay in touch and visit as often as we can. The fabrics in the charm pack were full of coffee-themed images in those warm, coffeehouse colors that are at once lively yet cozy. I bought the pack in the way that quilters often do — not knowing what they’d be used for, just knowing that they were absolutely essential for some future purpose. By and by, Christmas rolled around, this year, and I knew I wanted to make something for Nicole. I’d bought two charm packs with Nicole in mind about a year ago. I turned one of them (a neat, Frenchy-themed one called “Le Poulet“) into a nifty, quilted knitting needle case based on a pattern she and I picked out together from HERE. She said she could use two knitting needle cases, but I was ready to move onto something new after making one for her. Eventually, I settled in on making a throw (a small quilt) for her. It would turn out to be my largest completed project to date. I chose my pattern from a book James bought me for Christmas back in 2010, Country Theads Goes To Charm School by Mary Etherington and Connie Tesene. The name of the pattern was “Wash Your Hands Before You Eat” — one of the many strange, etiquette-related pattern names from the book. Looking at the picture of their quilt and mine, you can clearly see how making different fabric choices can take a quilt — even when made with the same pattern — into a totally different direction. For Nicole’s throw, I kept all of the pattern’s measurements the same. What I changed was essentially the colors used. More specifically, I modified the pattern’s use of color value (i.e. the lightness or darkness of a color). The original quilt used a lot of neutrals and set them against some colors that were slightly contrasting and yet fairly neutral. One quick look at my fabrics, and I knew I was working with a different palette of colors. Still, I liked the size and overall layout of the patches, so I wanted to make this pattern work. I would have to work carefully in pairing up the fabrics to showcase their stark contrasts rather than masking them. Basically, a lot of the brain work for this quilt was carried out on the design wall — deciding which combinations of charm squares worked and which ones didn’t. I’m never all that confident in my decisions about color, so I asked James and my mom for help along the way. It never hurts to get a second and third opinion, right? Once I had the four-patch blocks sewn, the next color challenge was arranging the patches so that the levels of color value didn’t draw your eye in strange ways across the quilt. Our eyes behave strangely when it comes to color — what seems pleasant to the “mind’s eye” doesn’t always work out in reality. I decided the best arrangement was to place the highest contrasting patches to the outside of the quilt center, so that at least their boldness would set off the rest of the patches rather than making the whole thing look jumbled. Beyond that, I tried not to obsess too much about mixing up the patches. I have a hard time creating things that look “random”… I think my left brain speaks up too often and insists on creating order. 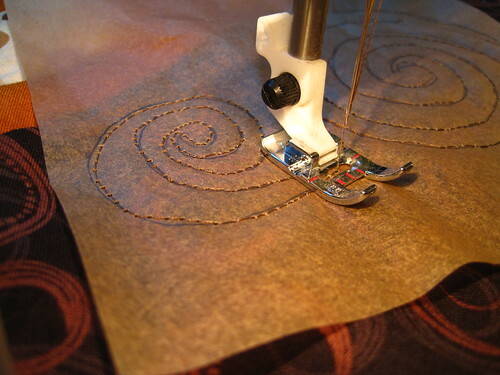 In this project, since I decided to stick to the measurements and design spelled out in the pattern, the lessons I walked away with mainly involved more confidence in machine quilting. With so many contrasting colors and vibrant combinations, I really wanted to showcase those four-patch blocks and yet the background squares needed something that would make them pop, too. I decided to face my fears of sewing unhidden, bold straight lines and make a pattern of on-point squares that would lend a strict, geometric motif to the quilt top. Now there were all kinds of squares in this quilt! 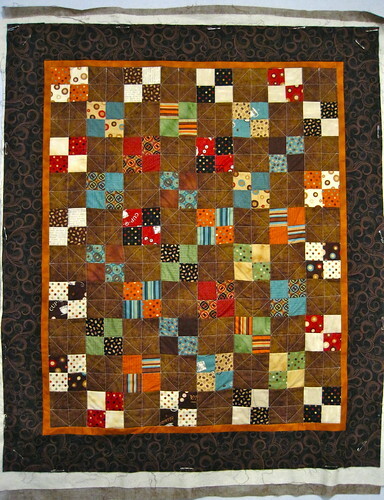 But, the biggest challenge of all was deciding what to do for my quilting pattern in the outer border. 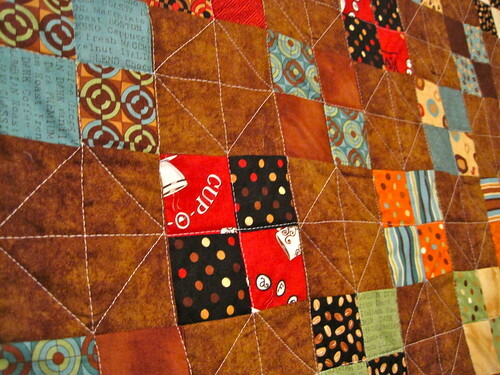 The fabric I’d chosen had a lot of swirling motion in it and the color was so much darker than the center of the quilt. I knew I needed something different. 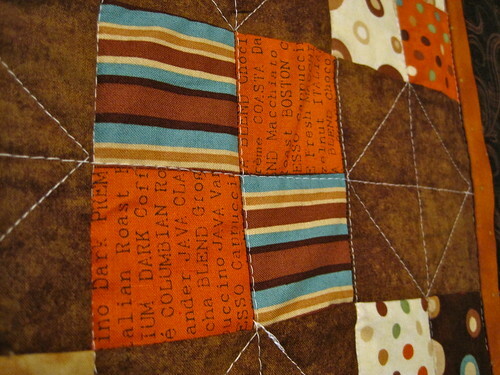 To solve the color contrasting issue, I chose to quilt the outer border in a darker, mocha-like color rather than using the white thread I’d used for the center. By chance, I found an outlined quilting pattern in Quiltmaker Magazine that I thought would echo the swirling motion of the fabric. 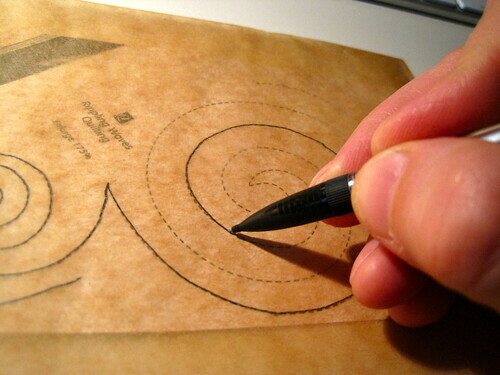 The only problem: I’d never used a quilting pattern/stencil before. 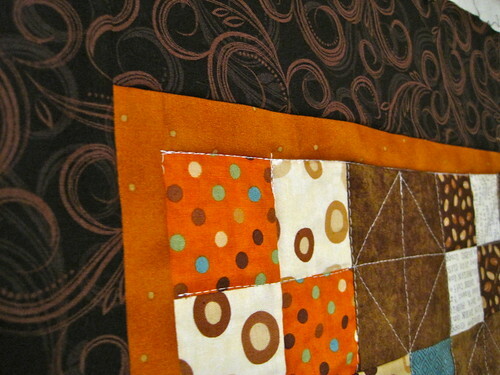 I did some research and eventually concluded there were so many different ways of transferring a quilting pattern onto fabric that there was probably no “right” way of doing it. So, I opted for the cheapest, most convenient route. I decreased the size of the pattern on my scanner and then traced it about 25 times onto small sheets of parchment paper. 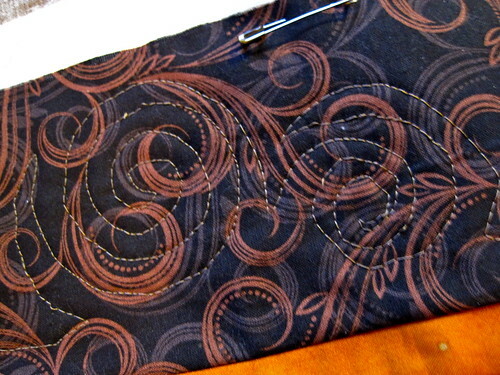 Then, I just pinned the papers to my quilt and sewed along the lines I’d traced. Sewing onto paper pinned to a fluffy quilt wasn’t the easiest sewing I’d ever done — the corners liked to pop up and miss the presser foot, sometimes there was puckering — but, it got the job done, in the end. The only truly time-consuming part of the process was tearing away the paper from the stitching… every single, microscopic piece of it. In the end, I survived, and I’m now more confident in my color choices — though I think I’ll always need a second opinion. Now the only choice is whether to pop this quilt into the mail or hand it to Nicole when she comes for her February visit. i miss u sooo much!! can’t wait to see you again! Wow! That quilt is gorgeous! 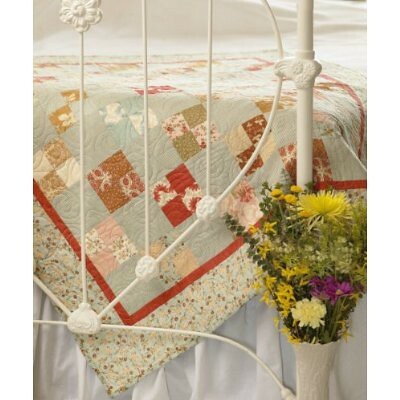 I absolutely love quilts and those are beautiful! You could do a side buisness with that… I’d order one 😉 I love looking at different fabric patches and how they would work. My husbands 90 year old grandmother made us quilts by hand for our wedding and childrens births and I love them. Thanks, Traci. 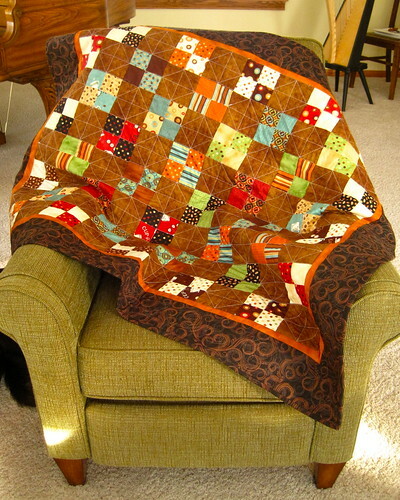 I’d love to be able to make quilts for people… maybe someday. Right now, though, I’m waaay too slow! The Pottery Barn patch, for instance: it takes me over two hours to sew each one! WOW. You never cease to amaze me. Beautiful. Thanks for sharing. Thanks, Shelley. Truth be told, I’m still very much a beginner. But — like most things I learn to do — I push myself pretty quickly and screwing up becomes a very frequent part of the learning process! 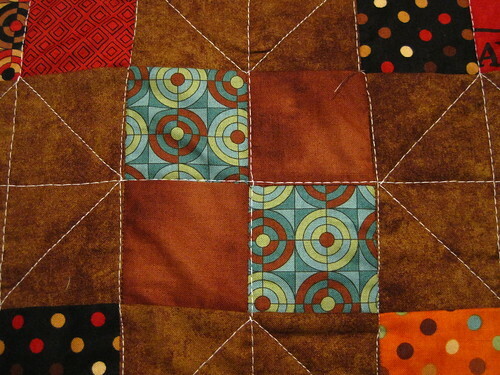 Appropriately, my learning began by reading and making a project from the book entitled “Quilting for Dummies”. 😀 It was a very thorough guide and taught me everything I needed to know to get started. I’d be happy to help you get started — it’s a very fun hobby and a great way to spend winter especially! I think the hardest thing about learning to make quilts is learning some of the sewing terminology that isn’t necessarily intuitive — words referring to fabric, cutting fabric, and the names of sewing machine parts. Once you get those things committed to memory and in your vocabulary, everything else is just a matter of practicing until it gets easier and easier. We’ll have to have you over sometime for a tour of the sewing room! I just found this email in my spam box???? I dont know how long its been there.But I love this quilt. I think it went to your junk mail because James sent out an e-mail to a LOT of people all at once and your e-mail must have thought it was spam.